We bought our previous home from a friend from church who was moving to a retirement facility. She left some furniture in the house which was greatly appreciated since we had very little of our own at the time. In the workshop in the basement there were a few tables-which my husband loved and we used the tables all the time. It was briefly mentioned that one of the tables-this table-was an antique. It looked pretty beat up and had layers upon layers of paint on it. When we were moving, we went through the house trying to decide which furniture to get rid of and which to move with us. I had thought this might make a good dining room hutch-I would just need to fix it up a lot. Then one day before we moved I was looking online to see what I should do in my kitchen in the new house. 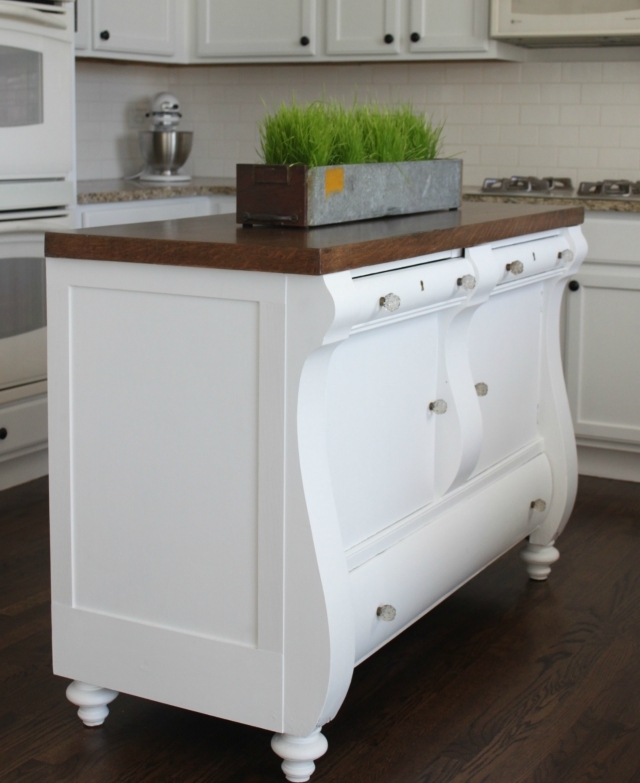 I loved the idea of a butcher block island-so I thought about buying some wood and putting it on top of an existing island, but that would be expensive to buy thick wood like that... but then I thought about that hutch in the work room. So I went over and sanded a little section of the top and under all of that paint was a solid piece of wood! I was so excited! Here is the beauty before.... Now, I didn't take too many pictures because this was one of my first projects in our new house, so I was just trying to quickly finish. And our garage was a mess with boxes and trash. But, from the picture, you can see I already sanded the top and had just stripped the rest of it. I used this spray stripper-but you guys- my husband just listened to a podcast or news report about how people have died using stripper and that ours is one of the only developed countries that still uses it-so if you use it, make sure you are in a highly ventilated area! I sprayed on the stripper and then used a metal scraper to get the paint all off. The stripper worked great-the layers of paint just peeled off-which is probably why it's so deadly yikes! I then used an electric sander and sanded all of the excess paint off. I knew I was painting it white-so the sanding didn't have to be perfect-but the top had to be sanded a lot more. I stained the top with Jacobean Minwax stain. After the stain dried I used several coats of clear satin polyurethane. Maybe like 8-10 coats total-this will be a highly used area so I wanted to make sure to get it well covered. I bought these wooden legs and put some wood gorilla glue to the top of the leg and screwed them in to the bottom of the hutch. I also bought some pieces of trim and used Gorilla Glue and finishing nails to attach them. Basically I added trim everywhere on the sides and back. On the front I only added new knobs that I bought at Hobby Lobby. I used trim caulk to close up any gaps left by the trim. I just love it! It is so much better than the normal island that was there before-it was just a plain oak island with a granite top. Some people thought I was crazy for getting rid of a granite topped island and replacing it with a beaten up old hutch. But I love the character of it and love that it's something we had in our old house. There are so many hutches and dressers at resale shops or flea markets-just think how great it could look with some added trim and legs!